The name Orangutan means "Person of the Forest" in Malay language. This description of Orangutans could not be more exact since these animals are almost entirely Arboreal. They eat, travel, sleep, and rest all in the tree canopy with the aid of hook-like hands and feet to help them grasp branches. Orangutans are a group of primates that are part of the "Great Apes" which include Chimpanzees (Pan troglodytes), Bonobos (Pan paniscus), and Gorillas (Gorilla gorilla) (5). 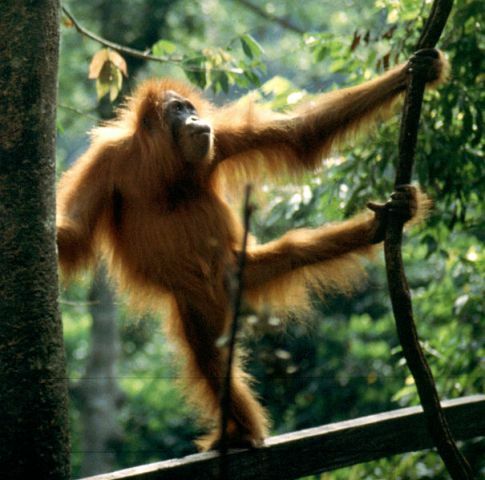 A distinction of Orangutans from the other Great Apes is that they possess arms that are roughly 7 feet long (almost twice the length of their legs) because of the amount of time Orangutans spend in the trees. Orangutans differ from Chimpanzees because these gentle & peaceful animals rarely exhibit the reckless and impulsive behavior that is common among the Chimps. If you enjoy your rest then you would really love the lifestyle of an Orangutan. These Primates spend around 12 hours of the day sleeping! The tropics result in 12 hours of sunlight and 12 hours of darkness so the Orangutans rise and retire with the sun. They even spend some of the daytime resting and napping (5). Although estimates differ with different individuals, during a 12 hour day Orangutans will spend 46% feeding, 39% resting, 11% traveling between their resting and feeding sites, and the rest of the time is spent constructing their sleeping nests (2). The only time that Orangutans spend traveling considerable distances is when they need to find more food or to find females to mate with. Males will travel the farthest and the fastest. This may be the result of their larger caloric needs and to find suitable females or to control male intruders. 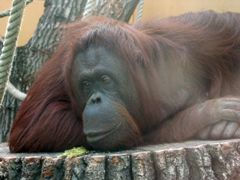 As noted before, when retiring for the evening or resting during the day, Orangutans construct sleeping nests. These nests are intricately woven with sticks and leaves. Every night an Orangutan constructs a new nest in a different location high in the trees. These nests are normally constructed near a food source that can provide a good amount of food for the Orangutan. The 40% of the day Orangutans spend resting is usually in quickly made sleeping nests.